You have heard it said that if you can ski in New England – you can ski anywhere. Well, these trails certainly support that claim. Our Northeast ski areas offer some of the most challenging trails anywhere, due to our terrain, our climate and the resulting unpredictable nature of our conditions. Although they are not as high in elevation as the West, the fall line and the natural elements inherent to our mountains present their own unique difficulty. A few of my selections feature sister trails on the same mountain, therefore possessing a similar pitch and style, so these trails are listed together. This has the added advantage of not precluding worthy trails at other ski areas. 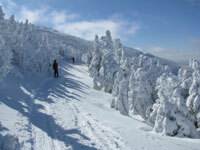 See also New England’s Most Scenic Trails and New England’s Most Interesting Ski Trails. 1. Rumble at Sugarbush Vermont. Dodging trees, negotiating bumps, stumps and jumps, the name Rumble can be quite literal. This narrow, winding and steep trail is part of the formidable Castlerock area, which is anything but glamorous skiing. We are talking narrow and natural with precipitous drop-offs. Try Liftline when you finish Rumble, or should I say – when Rumble finishes you. 2. 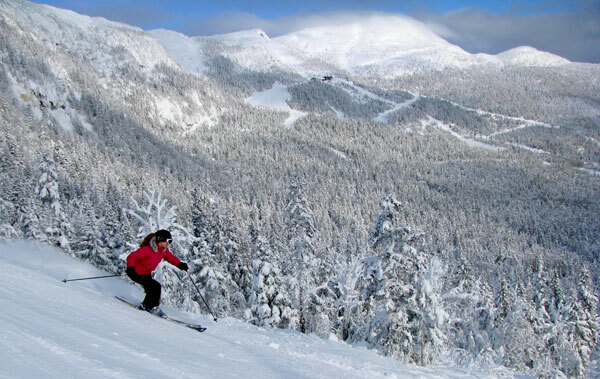 Goat at Stowe, Vermont is a heart-thumping, narrow, twisty run with serious vertical drop. This trail, along with the very steep Star, are outstanding adventures, part of Stowe’s famous Front Four. National and Nose Dive, while they are still awesome trails, no longer qualify since have been altered to accommodate the masses, and therefore have lost some of their “nasty” edge. 3. Robin’s Run, Freefall, and Liftline represent the double black diamond trio at Smugglers’ Notch, Vermont. If Stowe has its Front Four, Smugglers’ has these three that share the same incredible pitch in varying degrees of steeps, knolls and cliffs. Robin’s is much too narrow. Freefall is so steep that mini-avalanches occur with each jump turn. Liftline is under the lift – obviously, making it very intimidating between cliff bands, towers and the watchful eyes of spectators riding the chair overhead. 4. Muleskinner at Saddleback, Maine makes the list for high adventure. The traverse (or hike for snowboarders) out to this narrow trail will have you telling stories. The trail itself also presents a few challenges. You just have to ski it to believe it. 5. Shockwave at Maine’s Sunday River gets my vote. Neighboring White Heat receives all the accolades (longest, steepest, widest) and hosts all the events, but Shockwave is a little steeper, with a few twists. It is not an exhibitionist trail to those riding the quad, so you ski it purely for your own exhilaration. Off the beaten path, this trail is also posted as NFT: an acronym for “No Fall Terrain”. 6. Bubblecuffer at Sugarloaf in Maine can have bumps the size of Volkswagens. This trail starts at Sugarloaf’s snowfields, and continues on for what can seem like forever if you are not equipped with rubber knees. Serious pitch and big moguls make this double black diamond a trail worthy of bragging rights. 7. Ovation, located to the right of Killington’s popular Superstar as you ride the quad, is wide but very steep and just keeps getting steeper as it descends toward the Killington Base Lodge. Honorable mention goes to Devil’s Fiddle for its initial drop-off, located to skiers’ right of the legendary Outer Limits which receives the publicity as the steepest mogul slope in New England. 8. Giant Killer at Pico Vermont says it all in the name. This is the only trail on the east side off the summit of Pico. The steep pitch with big, firm moguls presents a fierce combination. 9. Mad River Glen in Vermont makes the list, not for any one particular trail, but for all of the au naturel skiing without modern grooming and snowmaking. The conditions here are completely at the whims of Mother Nature. That can make the ski experience very challenging – hence the slogan, “Ski it if you can”. If I had to choose one most difficult trail here, it would be Paradise. 10. 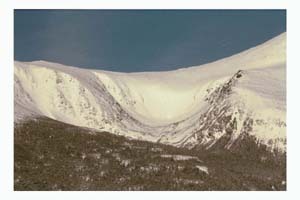 Tuckerman’s Ravine, though not lift accessed, must be experienced if you wish to join the ranks of truly hard-core New England skiers. First you must climb the two-mile approach to Mount Washington lugging your equipment. This separates the big dogs from the puppies. And if you are going to do “Tucks”, do it right, over the Lip or Center Chimney. Please consult your physician before attempting this activity.